Having for several years tried to find a female who played an important role as a “whiskey man” in America, I have at last come across an extraordinary woman. She is Mary Dowling of Anderson County, Kentucky. Not only did she own and run a major distillery, shown above, she found away to stay in the liquor business after 1920 and, in effect, thumbed her nose at National Prohibition. She was born Mary Murphy in 1858 in the State of Kentucky, the daughter of Irish immigrants. Little of her girlhood or education is recorded until she reached the age of 17 when in 1875 she married a man at least 17 years her senior. His name was John Dowling. They would have nine children of whom eight would live to maturity. During the early 1880s Dowling joined the original partners and the firm became Waterfill, Dowling & Company. At the time the distillery was mashing 60 bushels a day and had a storage capacity for about 3,000 barrels for aging the whiskey. Over the next few years the facilities were greatly expanded. By 1890 mashing capacity had been increased to 125 bushels and warehouse capacity exceeded 9,000 barrels. Insurance records from 1892 noted that the entire distillery was ironclad with metal or slate roofs, including four bonded warehouses and one “free” (from Federal regulation) warehouse. Slops from the fermentation process were being used to feed hogs that were housed in pens near the still house. By 1890 the Anderson County distillery was mashing 250 bushels per day and had a warehouse capacity for 21,000 barrels. Over the years John Dowling increased his ownership of the facility and in early in the 1900s became the full owner, with his brother Edward assisting him. 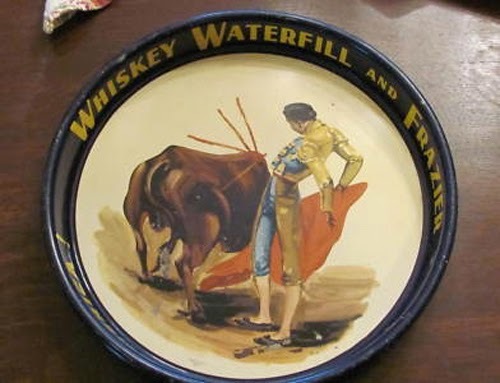 They kept the “Waterfill & Frazier” name for their flagship brand and also did business as the Pilgrimage Distilling Co., with offices in Cincinnati. About the same time, apparently recognizing the business acumen of his wife, John brought Mary into the company. Not long after, he died at age 61. His grieving widow inherited the firm and its management, becoming one of a handful of women in that era to run a major distillery. During ensuing years, Mary Dowling became part of Kentucky whiskey lore in her evident ability to control a major operation. Even a major fire in 1904 that destroyed the distillery did not deter her and the facility was quickly rebuilt. When Mary’s sons came to maturity, they too were brought into the business. As her reputation as a businesswoman rose in Anderson County, she followed other economic opportunities. She became a founding stockholder of the Anderson National Bank in 1907, capitalized at $100,000. Mary was not, however, given a seat on the bank board. Her illegal business worked for about four years until 1924 when revenue agents set a trap for the Dowlings, who were operating both out of their home and from an office next to two distillery warehouses, supposedly sealed, in which large quantities of liquor were stored. Federal agents arrived with two “turncoat” bootleggers in their automobiles, men who had done business with Mary in the past. The agents watched as the bootleggers entered the house and bought out two sacks of whiskey, each containing a dozen bottles. They watched as the sacks were placed in one of the autos, then searched and seized them, as their stool -pigeons reputedly ‘fessed up. The “sting” had worked. The agents thereupon entered the Dowling home with search warrants. The Dowlings were prosecuted for a conspiracy to possess, transport, and sell intoxicating liquors in violation of the National Prohibition Act. There ensued three years of court cases both in Kentucky and Federal courts as the Dowlings through their attorneys contended that the search warrant was flawed, that criminal charges should be dropped, and the seized liquor returned. An initial trial was adjourned when Mary Dowling became sick. The indictment was renewed by the government in 1925 and this time the Dowlings were convicted. Then fate intervened. Upon the Dowlings' appeal of the conviction to the U.S. Sixth Court of Appeals, it was found that the stenographer who had taken the record of the earlier trial had died and no one could read his notes. That was enough for the Circuit Court and they threw out the convictions. 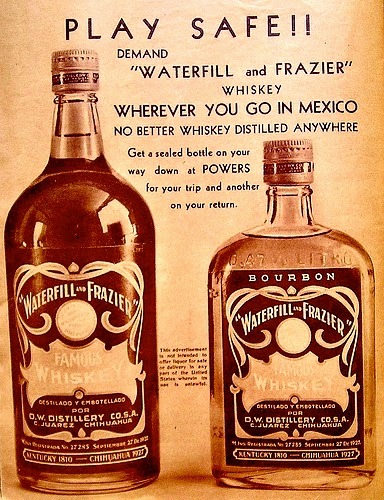 The primary market for this Waterfill & Frazier whiskey was in Mexico and Central and South America. Compared to the local whiskeys, Mary Dowling’s “bourbon,” (actually a blend) was a quality product and highly successful. As a result a number of artifacts bearing Spanish language and theme, particularly trip trays, can be found on auction sites. Because Juarez, in the state of Chihuahua is so close to the U.S. border, thirsty American tourists also could enjoy it and even, as an ad hinted, bring a bottle or two with them back to the U.S. There also is evidence that Mary Dowling had found other ways to get her whiskey to the American consumer. A letter exists to her from Julian Van Winkle, one of those lucky distillers with a “medicinal” license. He complained that his sales reps were having trouble selling her Kentucky-made Waterfill & Frazier Bourbon because of competition from other quarters selling her Mexican product. Van Winkle did not even hint at how Mexican bourbon might have made it onto the legal market in the United States. He knew Mary already knew. 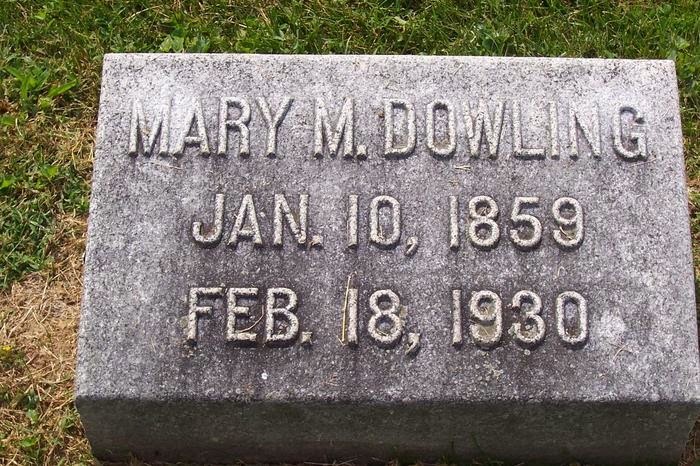 In 1930, four years short of Repeal, Mary Dowling died and was laid to rest in Section 5 of the Lawrenceburg Cemetery in Anderson County. In the grave next to her is John Dowling whom she outlived by 27 years. 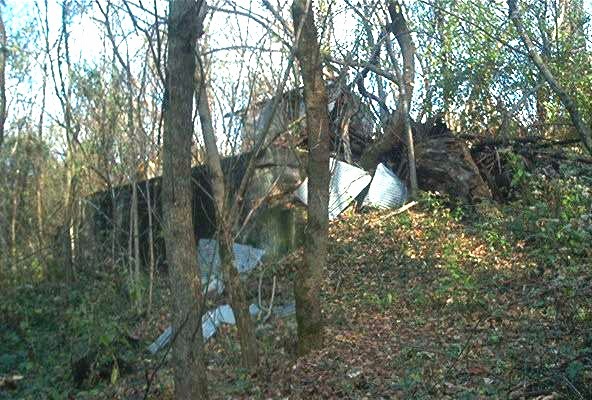 As shown here, the remaining buildings of the Anderson County distillery were allowed to decay as the forest grew up around them. After the end of Prohibition in 1934, one of Mary’s sons, also named John, built a new distillery at Fisherville, just outside Louisville at Echo Trail at Ford’s Fork. 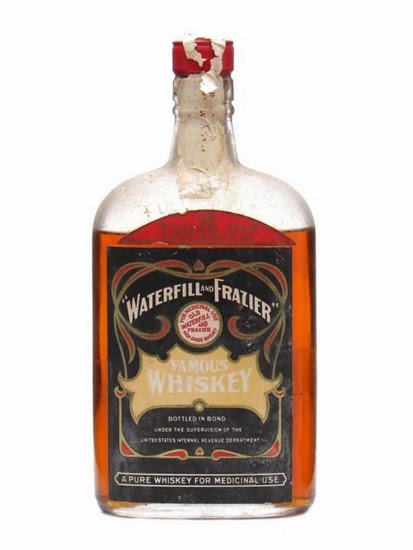 Sometime later he sold the property to a Kentuckian who closed the facility but kept the Waterfill & Frazier brand name and label design transferring both to Bardstown where he had another distillery. Thus some U.S. bottles and artifacts designated “Waterfill & Frazier” are post-Prohibition. Although she died before witnessing Repeal, Mary Dowling had forged a path for women -- and men -- in whiskey history that may never be surpassed. Unlike most of the male Kentucky distillers who quietly shut down, Mary actively rebelled against the “Dry Laws” and after one attempt to circumvent them proved to be problematic, created a second strategy that succeeded beyond all expectations. Call her “mysterious" or “infamous,” as some have done, I call her a genius for having thumbed her nose at National Prohibition and beaten it. The Joseph L Beam family remains grateful to Mary Dowling for helping them stay afloat during prohibition. After Joseph L returned to Nelson Co. From Juarez, he was twice elected Jailer of Nelson Co before the end of prohibition. My great-grandfather Joseph L Beam and my grandfather, Harry Beam + his older brother Otis Beam were the Beams Mary Dowling hired to build the DM Distillery in Juarez during prohibition. 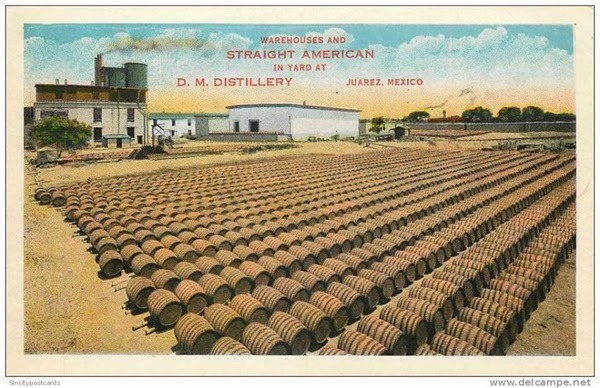 I recently found film footage of the DM Distillery in Juarez here: http://www.texasarchive.org/library/index.php?title=Juarez,_Mexico_-_American_Distiller_Opens_Plant_Below_Border,_Introduces_New_Process_to_Age_Certain_Beverages_Banned_in_U.S. Dear Harry Beam: Thanks for your excellent addition to my post on Mary Dowling. She was undoubtedly a woman of considerable gumption and intelligence. The footage on the Juarez distillery is of considerable interest.